We're happy to be offering pacers for a variety of finish times to either give you company on that first half marathon, help you accomplish your time goal, or maybe help some veteran runners set a new personal record! We have one of the biggest pacing offerings in a local half marathon, with 5 minutes intervals from 1:45 to 3:00 finish times and also a pace team for a 3:30 goal finish. 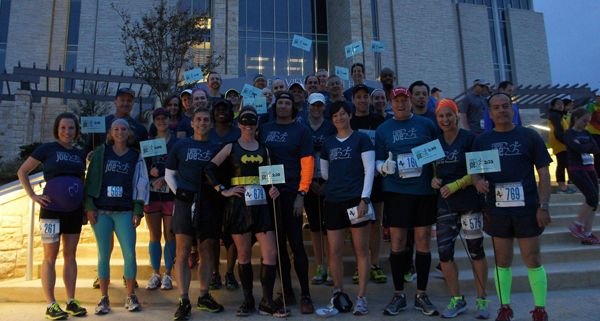 36 veteran runners are ready to help YOU! Click on a goal finish time to skip down to that pace team's biographies and pictures. Thank you to Andy Rose, our Pace Squad Organizer! Questions about the pacers? Email pacesquad@theactivejoe.com. Pic and Bio to come! Emilio ran his first Half Marathon in November 2015 at the McKinney Mini and has ran 4 half and 4 full Marathons since then. With the help and support of running partners, Emilio has achieved PR’s of 1:34 HM and 3:33 Marathon thus far. 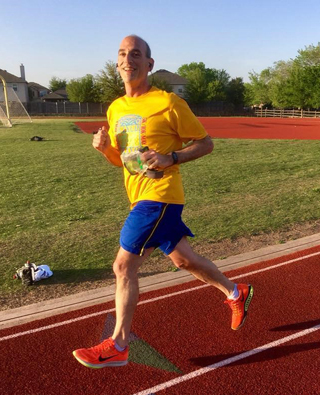 In 2018, he ran both the Houston and Cowtown Marathons finishing with an average time of 3:34. Emilio is excited about the chance to help others achieve their running goals. 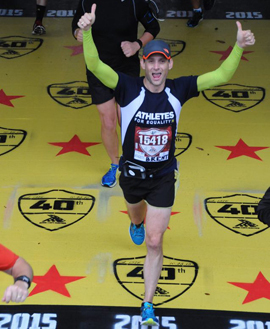 Josh has enjoyed running since he found a passion for it while on his high school track team. As an Army Officer, he continued running through the 90s. He ran his first marathon in 2001 and now some 30 years & countless miles later, still enjoys pounding the pavement! He has completed 3 Full & Numerous Half-Marathons. Blake is a civil engineer and father of 3 and has been consistently running for the past 12 years. He has completed over a dozen marathons, numerous half marathons, and several triathlons including finishing two ironman races. He is looking forward to leading the 1:50 group to their goal finish time. I am a long time runner and love helping others work towards their goals – whether it is a distance goal or time goal! I enjoy anything from trail running to obstacle course races. 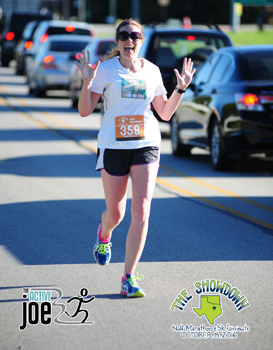 My favorite distance is the half marathon – such an accomplishment while fun at the same time! I am looking forward to helping you reach your goals at the Fairview Half Marathon! Come join me and our awesome pace team and we can help you cross the finish line at this amazing race. Brent started running 3 years ago. He’s run races from 5k to 100k, but thinks the half marathon distance is still the most fun - long enough to feel like you’ve earned a stack of pancakes, but short enough to still be fun. He enjoys participating in other people’s successes as much as earning his own, so pacing is a perfect fit! Jonathan Celone has been a distance runner for roughly eight years now! This Husband, Father of one, and Living Kidney Donor has completed 70 half marathons and 8 marathons to date. He is excited to help lead the 2:00 pace group to the finish line! 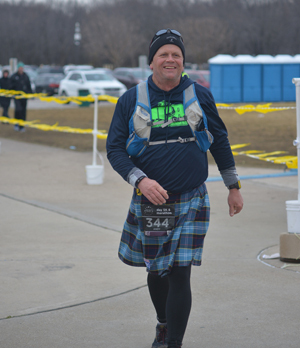 Mike started running off and on many years ago but began taking it seriously about 12 years ago after medical concerns along a family history of heart problems motivated him to decide on fitness rather than medicine. He now runs at least 30 minutes/day for 6 days a week and goes for 13 miles or longer every Sunday. He is a running addict and finds time each day to get outside: rain or snow, sun or storm. Most recently he completed his first Ultra at the 2019 Cowtown in Ft. Worth, finishing the marathon distance in a PR setting 3:50:02 and the full 50k in 4:45:46. He is looking forward to supporting his fellow runners by pacing the Fairview Half Marathon. 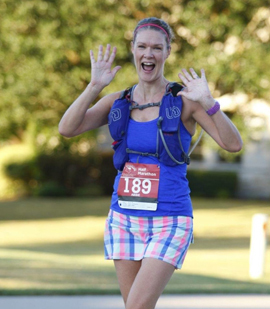 Teri started running 9 years ago trying to keep up with a running toddler and never stopped. She completed a 100k last year on her birthday. When people ask her why she runs, she say it's because I like to eat! Pacing is the best! It's so rewarding to help other people along their journeys to achieve their goal. Gina started running two years ago after a lot of persuasion from a close friend and inspiration from her son and the I Run 4 community. She started out running her first 5k in September 2016 and quickly got hooked on the sport. After a few more 5k’s and a 10k she quickly set a new goal of running her first half marathon on January 1, 2017. 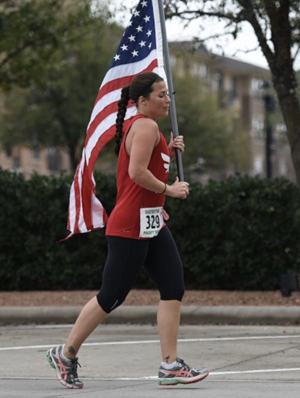 Loving the feeling of accomplishment she has since completed several more half marathons and more recently completed her third full at the Marine Corps Marathon in October 2018 and is currently training for the Boston Marathon. Gina loves setting new goals and making them a reality. She is very excited to be a pacer and help fellow runners achieve their goals. Letty is a mom of two girls and a former resident of McKinney. She currently resides in San Antonio, her hometown. 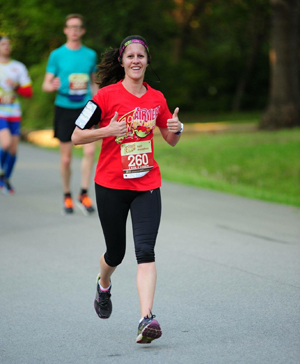 She began running when she signed up for her first 10K in November 2012. In 2014 she joined her gym's run group, Life Time Run, and ran her first half marathon in October. Twenty plus half marathons later (several as a pacer), 10 marathons (three as a pacer) and many 5Ks-15Ks, running is her happy place! 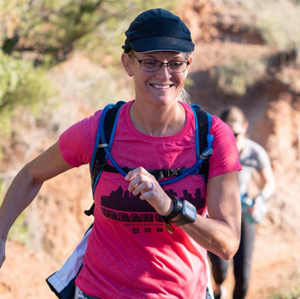 Pacing has become one of her passions because she loves giving back to the running community by helping and encouraging runners to achieve their goal! She's looking forward to meeting you at The Fairview Half Marathon and getting you across that 2:10 finish line! Lori began running in 2012 with a simple plan of completing a 5k the completion of that plan lead her to run her first 25k in October 2013 which then lead her to run her first Marathon in April 2014 with three more Marathons to follow, she has 13 Half Marathons, 5 Spartan Races and did her first 50k in 2018. 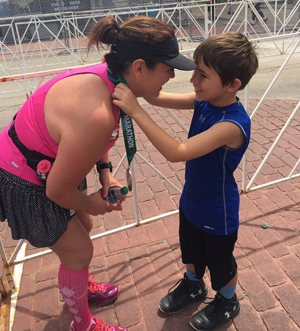 Lori loves helping others grow and watching them succeed in life and running. This will be Loris first time pacing and is very excited to meet new people, have fun and get them to the finish line. 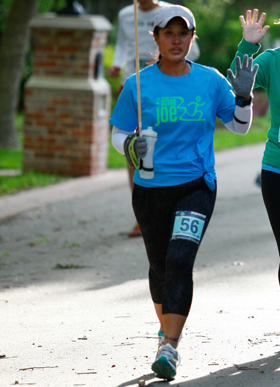 Tracy first signed up for a 5k training program 7 years ago and got hooked. Since then, she has run multiple half marathons and 3 full marathons, including Phoenix Mesa Marathon in February of 2019. She currently works as a Run Lead at a local fitness club. She enjoys running with friends and training toward her next race. She is CPR and AED certified. 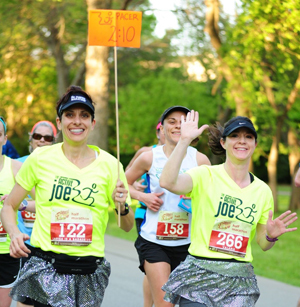 She considers pacing a great way to meet new runners, while helping them meet their goals. Brandi began running 5k's in 2010. Her first half marathon was in 2013. After numerous half marathons, she finally ran her first full marathon in 2016. One of her biggest joys is sharing the love of running with her husband, Brandon. Brandi belongs to a local running group and she is also the run coordinator of her group. She enjoys seeing the joy of people achieving their goals, whether distance or pace. Brandi finds pacing every bit as satisfying as running her own races. 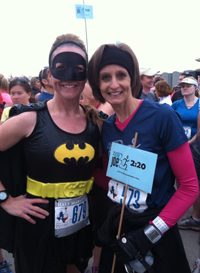 Valarie and Larisa are great friends who share a love for running and having fun! 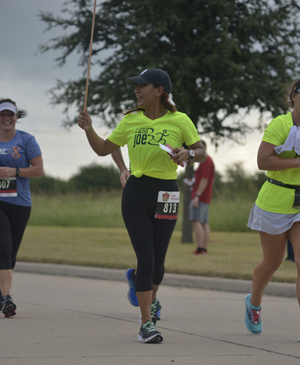 Larisa leads a local running group, providing the routes and workouts, while Valarie provides the fun and entertainment. While balancing life with 2 kids each, husbands, jobs, volunteering, etc., they always find time for running the streets of Allen with friends. (It’s great therapy!) Between the two they have completed 13 marathons and countless half marathons. 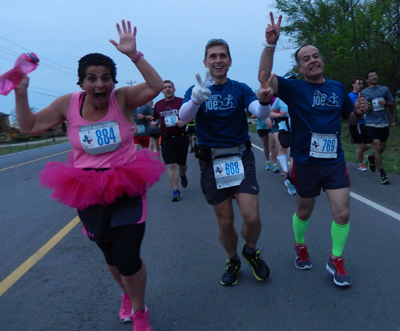 They are excited to be back for the second year pacing the best local race as they love helping others achieve their running goals. The plan is to make sure their pace group has the most fun running 13.1 miles- EVER! Meet Jesica King! 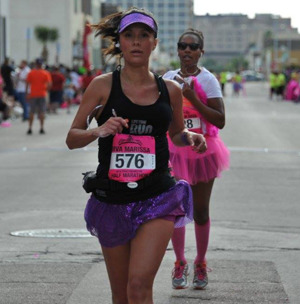 Jesica has run countless half marathons, 7 full marathons and 1 Ultra. Most often you will find her carrying the Unites States flag with the hopes of inspiring us to be better Americans.....whatever that means to you! Grace started running in January 2013 after a long battle with cancer. She has run over 200 half marathons, 21 marathons, and 5 ultra marathons. Running gives her a positive outlook at life. She lives with no regrets. She wants people to look at her and say "this is what cancer looks life after you've had it." Ken picked up running in 1998 after he realized he had to do something to lose weight. Since then he has run 23 full marathons and over 70 half marathons. 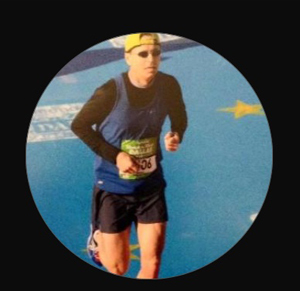 Ken is an RRCA certified running coach and has been coaching for more than 10 years. Currently Ken coaches a “Galloway” run group in Houston. 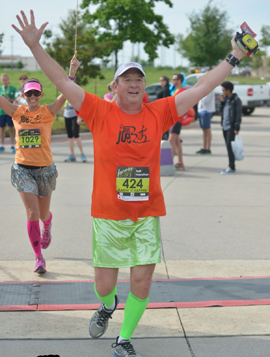 Ken believes in having FUN while running… and has been known to tell a story or 2 as well as sing during races. (Get your song requests ready!) The bottom-line: He enjoys sharing his love of running with all and has a simple motto… if he can do it, YOU CAN DO IT! Come join Ken for the 2:35 promise land! Jenny has been running since 2010. 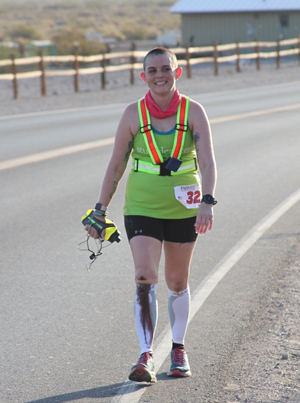 She just recently completed her first 50 mile ultramarathon, has completed multiple 50k’s, full marathons, half marathons, and has paced multiple half marathons. 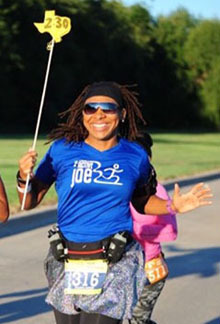 She is President of McKinney Running Club and loves giving back to her running community. She has an incredibly supportive husband (and he double’s as an amazing pit crew when necessary) and a chocolate lab who is also an avid runner. Abbie started running a couple of years ago as an easy way to keep fit with two young children and a busy job along with giving her the opportunity to meet new people after relocating to Texas from the UK. Running gave her all that and so much more. 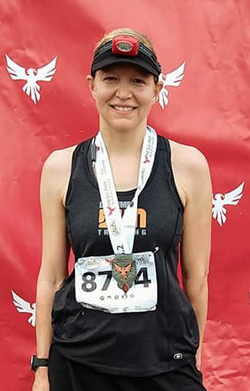 As well as making amazing friends through the local running community she has done things that she had never dreamed she would including several half marathons, overnight relay races, and a marathon. S he is so excited to pace the Fairview Half Marathon to support and encourage others to achieve their goals just like she has been helped by the amazing local running community over the last couple of years! 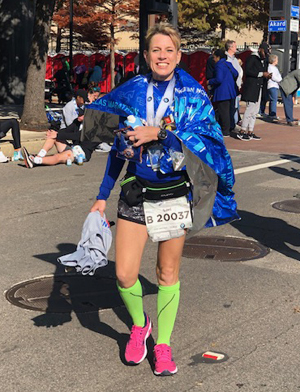 Gigi Smith has been running for over three years and has loved the journey that has taken her to complete 4 marathons, over 30 half marathons, and numerous 5 and 10K’s. She started her training with a Couch to 5K training regime but failed after numerous solo attempts . It wasn’t until she started running with others that she was able to finally finish that 5K finish line. That’s when she realized the value behind running with a group of friends with similar goals. Her philosophy on running is to get out there and have a great time while encouraging others to achieve their goals! She is looking forward to seeing you at the race!!! Marissa started running in June 2014 when she joined her gym's run club and have since run various 5ks, 10ks, halfs and marathons. Running is her therapy and although it is an individual sport she have made many good friends that share the same passion she does. 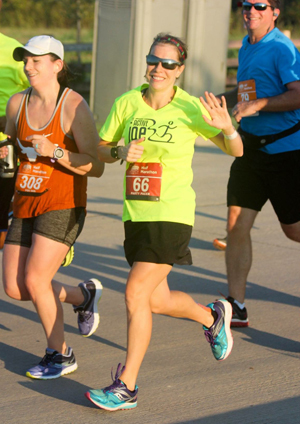 In her short time running she also had the opportunity and pleasure of pacing a few races and enjoys that as well as it is a great feeling helping others experience the joy of running. Marissa is very excited to pace Fairview half marathon this year and look forward to running with you! Telander is the mother of twins that are high school seniors. Her kids are her personal cheer squad and love to tell their friends that she is a runner. She started running with the couch to 5k app 5 years ago. She fell in love with running and has not stopped. Telander travels across the country running for fun with friends. Pacing brings her so much joy! Helping you to reach your goal while having a great time and memorable experience is her job! She looks forward to helping you reach your goal!! Jim started running later in life when he decided he needed more cardio for all the racquetball he was playing. He took up running supplemented by weightlifting and road biking for overall cross training. 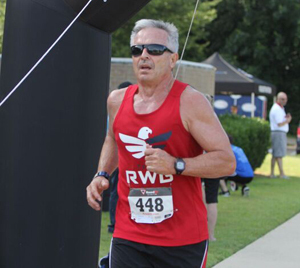 He never returned to racquetball as he enjoyed the new cardio regimens.. Jim competes in 5 and 10Ks, and runs half marathons for PRs. He currently runs three to four social runs a week to stay on par and cherishes all the friendships made through running. Pacing helps Jim help others attain their goals whether they are a beginning runner or a runner looking to set a PR. Helen has been running for 7 years. She loves running and the way it makes her feel: confident, strong, healthy, and badass! She loves helping people achieve their goals, whether it's their first race or their 2000th race! She generally prefers longer distances, but thinks the half distance is so much fun! It's long enough to be substantial and challenging, but short enough that most people can be successful in tacking it. It also leaves most of the day for people to enjoy with their family and friends. Andy is an ultrarunner who runs both trails and roads. 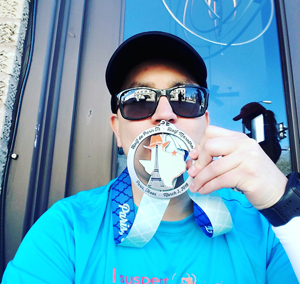 He started running in 2011 to raise money in memory of his nephew, Mavrick, for the Leukemia & Lymphoma Society and what started out as a goal to run one half marathon, has turned into an avid love of running. 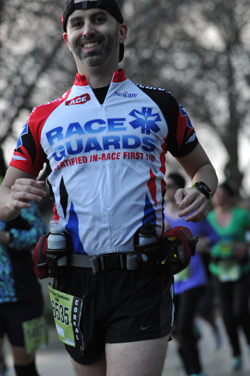 He loves pacing races and working aid stations as much as he does running them. His motto is simple - "Relentless Forward Progress". Chauncey began running in 2009 after her best friend talked her into walking the L.A. Marathon. Though she was a certified personal trainer, Chauncey did not run or walk long distances. It was a miserable, humbling first race, but it made her determined to become a runner. Since then, she has grown to absolutely love running and completed races from 3k to 50 miles, including 12 marathons. Whether it's a friend or a client, pacing someone to achieve a PR or finish a race for the first time is one of her favorite things. Chauncey is super excited to run with you as you rock that 3:00 finish time! This is Drew. And there are many Jeffs in the world, and many Toms as well. But this... is Drew. You maybe thinking, And...? But are you Drew? No you are not. Neither is Scott Baio Drew. Frank Gifford is not Drew. But this... is Drew. The Running bug hit in February 2011 when he did his first half marathon. Since then he has done over a hundred of them and several marathons , a ton of 5 and 10K's for the heck of it. The Active Joe, Rock and Roll and now Disney tend to be where most of his race money is spent, and for good reason. Drew belongs to the Rock and Roll Gypsies, NTX Runners, Black Sheep and Hogwarts Running Club. People seem to like running with him, he can't tell you why. Not the slightest clue. However if you want to find out, come see him at Fairview! These are two strong runners who are comfortable running anything from a 1:50 to 3:00. They will fill in for any last-minute problems where a pacer can’t attend (sick, emergency, sick family, etc.). If all the pacers show, they’ll choose which pace team they want to run with to help out those participants! 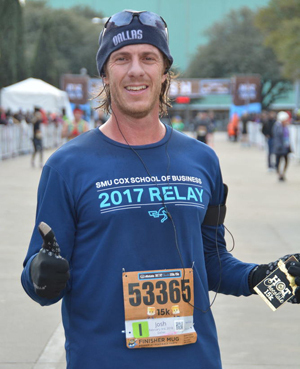 Brandon is a husband, father of 4 and owner of RunForSpeed.com and the EXCELR8 Running Club, one of the largest running clubs in the DFW area based out of Wylie. He literally paces for a living and has helped clients complete distances from 5Ks to Full Marathons including several of The Active Joe Events. 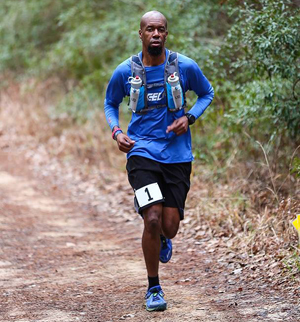 As an avid runner, he's run events from 100 meters to 100 miles. 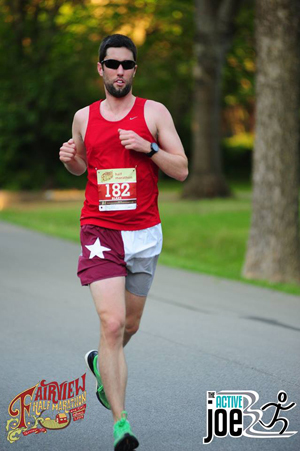 Brandon enjoys giving back to the running community and he feels pacing is a great way to do that. He looks forward to getting you from the starting line to the end of The Fairview Half Marathon! Suki started running in 1976 and has ran 100,000 miles so far. New York City marathon was her 1st marathon in 1986 and she has been unstoppable since then! She is an ultra runner and she has ran many marathons including Boston, Chicago, Marine Corp, Myrtle Beach, Duke City, Louisiana Marathon, Dallas WR marathon to name a few…and ultra marathons such as 50K, 50 mile, 100k to 100 mile & 24hr.National Championship races and 7 day International Ultra marathon, LOUTRAKI in Greece in 2006 and ran for 350 miles. 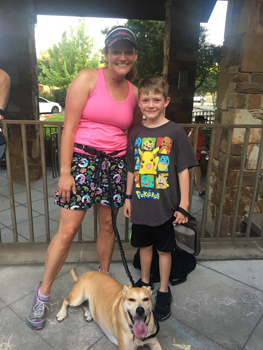 She was a run group coach at Lifetime Fitness Plano in 2005-2008 and she has her own weekly run group at Barn’s & Nobles/Old Starbuck’s on Preston Road for last 26 years. Running and fitness is her passion for most of her adult life. She is a certified fitness Instructor at local gyms and loves helping others to stay healthy and fit for life. She is very excited to run with you at Fairview Half Marathon to help you achieve your goal!